If you’ve ever spent some time in a classy resort or hotel then you’ve probably already experienced showering in a tile or stone shower. 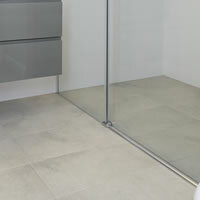 You’ll probably agree then, that a staple in any luxurious bathroom is going to be a tile or stone shower. Both tile and stone come in neutral colors and earthy tones that will work perfectly with any existing bathroom decorating scheme. 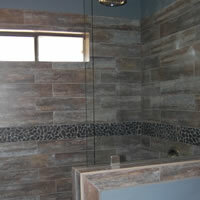 Lonestar Home Solutions specializes in designing and building custom tile and/or stone showers into Central Texas homes. We can go through the entire process with you from the initial planning phases to actually designing what the shower will look like, the tile or stone we’ll be using right down to the shower controls and shower head, or shower heads if you really want an awesome showering experience! Borders, Pebble in-lays, Shelves, Benches & Built in Niches – These are usually only found in the tile or stone showers built by craftsman because they take a great deal of knowledge and skill to pull off. 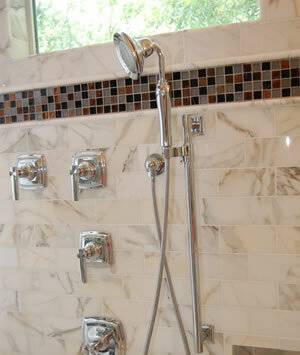 Lonestar Home Solutions takes pride in the meticulous tile work that we do. We can seamlessly integrate any of these options into your custom tile shower without the typical mistakes you’d see in a lesser experienced contractors work. 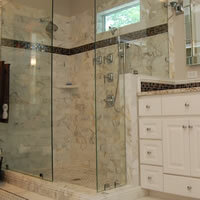 Do you have an idea for the shower you’d love to see in your home? Have you seen a beautiful shower in a magazine, or want to replicate that spa like experience you had on your last vacation? Tell us about it! 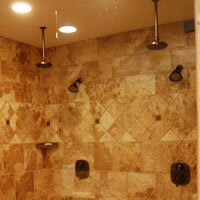 Lonestar Home Solutions can build you any type of shower you desire. With your creativity and our construction know-how we can work together to build you the ultimate showering experience.